Next week is Dr. Seuss’ birthday (March 2). Teachers and parents around the globe enjoy celebrating his birthday through crafts, activities, special food and parties. Some celebrations can be quite elaborate but there are plenty of simple ways to celebrate Dr. Seuss and Read Across America day. In fact a quick search of the web or Pinterest will show you thousands of ideas. Angie, from Country Chic Cottage and I are excited to share a few simple ideas to help you find something that will be just right for your home or classroom. The ideas pictured above can be found on this Pinterest Board. Just click the links and it will take you right to the details. Follow our Simple Seuss Celebrations board on Pinterest. Angie has a huge variety of creative Dr. Seuss crafts and treats. She also has a fabulous round-up of 40+ links for Dr. Seuss crafts, parties, printables and activities. I’m sharing 20+ of my obSEUSSed with Dr. Seuss activities, crafts, snacks and party ideas here. Plus I’ve collected more than 1,500 Dr. Seuss ideas on several Pinterest boards. Check out boards for Dr. Seuss parties, classrooms, crafts, Grinchmas, activities and more. Sarah from Bombshell Bling shares her own Dr. Seuss décor, printables, crafts and more. Sara from Mom Endeavors shared 75+ Dr. Seuss crafts, activities and recipes. Jill from Kitchen Fun with my 3 Sons has amazing visually creative snacks for kids. She has a great round-up of Dr. Seuss recipes and crafts. Taralyn from Keep Moving Forward with Me blog shares 6 simple Dr. Seuss ideas. Ashlee Marie is the most fabulous cake maker I personally know. 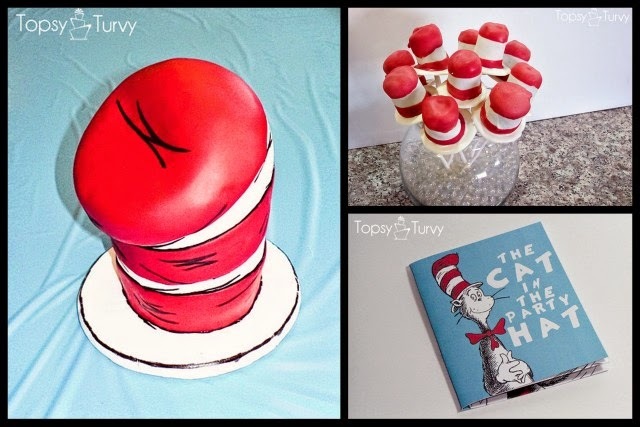 Here is her Cat in the Hat Cake, Cake Pops and printable Dr. Seuss book invitations for parties. Jamerrill from Free Homeschool Deals share 100+ Dr. Seuss printables, crafts, recipes, activities and more. Great Hands-on activities inspired by Dr. Seuss at Learn with Play at Home. Tons of Dr. Seuss teaching printables and ideas for Read Across America Day at the Teaching Blog Addict. Katie from Clarks Condensed blog shares tons of ideas for a Dr. Seuss themed party or baby shower. We hope you can find a few simple ideas from these lists to choose your own way to celebrate Dr. Seuss’ birthday and Read Across America Day sometime in March. You don’t have to do it on March 2nd. It is fun to celebrate with this theme anytime of year. Happy Seussabrations!